In breaking news, Madison Reed, a prestige hair color brand, applauds the movement toward authenticity in advertising and announces that it is advancing the cause with a pledge to use unaltered, raw photography. In these images, nothing will be adjusted. In fact, many brands are incorporating what appears to be body positivity into their advertising efforts. This contradicts earlier theories which suggest people are drawn to body types with more fat as they could historically survive a famine. In reality, everyone just really wants to look their best, right? 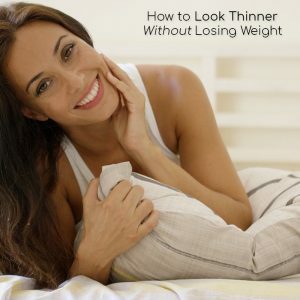 So read on to discover how to look thinner without losing weight. You’ve probably heard, “never wear horizontal stripes if you want to look thinner,” but believe it or not, the opposite is actually true. Who knew? “A square composed of horizontal lines appears taller and narrower than an identical square made up of vertical lines.” This illusion was discovered by Hermann von Helmholtz in 1925 and is also known as the Helmholtz illusion. There is an easy, all-natural way to slim your face and reduce a double chin without ever losing weight. It’s done with facial exercise, sometimes called facial yoga, in particular the Facial Magic Facial Exercise System. Facial Magic can sculpt a toned, symmetrical, more defined, wrinkle-free face and neck in just minutes a day with nothing but a pair of white cotton gloves and your own two hands. It’s proven to freeze time or even reverse the look of aging without painful, expensive injections, lasers or surgery. Many people erroneously believe that if they wear loose-fitting clothing that they will look thinner. The opposite is actually true. Fitted clothing makes people look better no matter what their shape. Don’t make the mistake of thinking baggy clothes hide flaws. They could actually accentuate them. Choose knits with small, tasteful patterns and avoid monochrome or big, loud patterns. In addition, choose a nice shapewear garment to smooth your silhouette under that lovely fitted apparel. My new favorite is the Self Expressions Suddenly Skinny Cami, which you can find online and at some retail stores.